The great thing about dining out in Bangalore is that delicious food is available from regions all over India. Tantalize your taste buds at these top iconic Bangalore restaurants, with a focus on Indian cuisine. Oota is the result of two chefs traveling 20,000 kilometers over 100 days and across 10 regions in Karnataka to research the state's culinary heritage. The restaurant, whose name is derived from the customary Kannada greeting "Oota aita?" (Have you eaten? ), serves up Karnataka on a platter. On the vast menu, you'll find both little-known and popular dishes from South Karnataka, the Canara coast, the Western Ghats, the Deccan tract of North Karnataka, and the borderlands of the Hyderabad-Karnataka region. Many recipes come from local communities and have been handed down over generations. Opening Hours: Noon to 3:30 p.m. for lunch. 7 p.m. to 11:30 p.m. for dinner daily. Cost: 2,500 rupees for two people. What's Good: The signature set menus for a bit of everything. 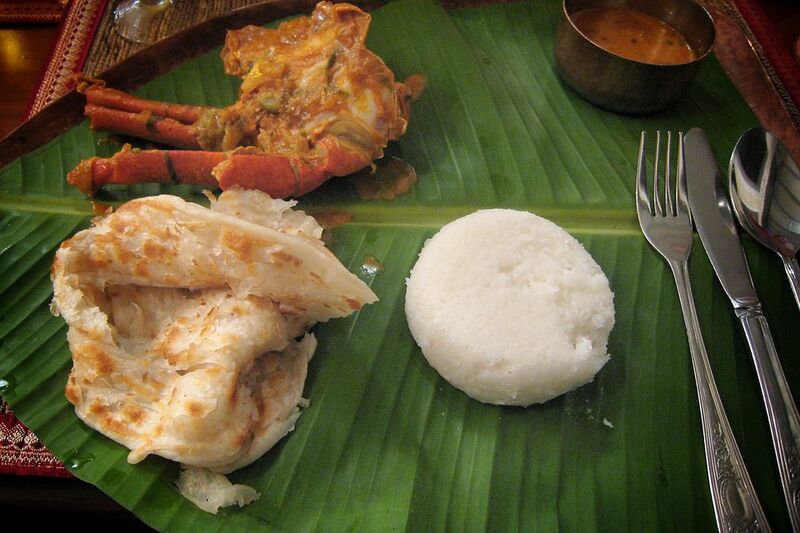 Seafood lovers make it a point to come to Karavalli, where the specialty is coastal Indian cuisine served on banana leaf. The restaurant is decorated in the style of a traditional local house, with high wooden ceilings and a variety of antique furniture and seafarers maps. The atmosphere is cozy and relaxed inside, and outdoor dining is also a treat in the open-air courtyard and garden. Opening Hours: 12:30 p.m. to 3 p.m. for lunch. 7 p.m. to 11:30 p.m. for dinner daily. Cost: 4,000 rupees for two people. What's Good: The seafood -- all of it! Elegant Dakshin is the ITC hotel chain's signature south Indian fine dining restaurant. Its menu consists of a diverse array of home-style dishes sourced from traditional communities in each south Indian state. Dakshin is also renowned for its Iyer's Trolley, filled with an appetizing assortment of adais, banana dosais, and kunni paniyaram. The fresh chutneys are highlight as well. Diners are serenaded by soulful live classical Indian music to complete the experience. Do note that children below 12 years of age are not permitted. Opening Hours: 12:30 p.m. to 2:45 p.m. for lunch. 7 p.m. to 11.30 p.m. for dinner daily. Cost: 2,000 rupees for two people. What's Good: The thali has mouthwatering mix of food from all the southern states. Mavalli Tiffin Rooms (commonly referred to as MTR) has been dishing up fuss-free vegetarian south Indian cuisine since 1924! It's the oldest idli dosa place in Bangalore. This legendary restaurant's main claim to fame is that it invented the rava idli, during World War II when rice was scarce. History, not ambiance, is what's important there. Expect to wait to be seated as it gets crowded. Opening Hours: 6:30 a.m. to 11 a.m. for breakfast. 12:30 p.m. to 9 p.m. for snacks and dinner. Closed Mondays. Cost: 250 rupees for two people. What's Good: Rava idli, masala dosa, and pure filter coffee. Vidyarthi Bhavan opened in 1943, in one of Bangalore's oldest locations, as a canteen for the young student community. It flourished and became a cultural center, attracting a regular clientele of writers, artists and film stars. These days foodies of all ages flock there, including those who love to reminisce about old times. It's likely you'll have to share your table with strangers as it's very busy! Opening Hours: 6:30 a.m.-11:30 a.m. and 2-8 p.m. Monday through Thursday. 6:30 a.m.-noon and 2:30-8 p.m. Saturday, Sunday and public holidays. Closed Fridays. Cost: 200 rupees for two people. What's Good: The masala dosa has a unique flavor that you won't find anywhere else in town. Another veteran Bangalore restaurants that's been in business for decades, Tandoor may be nondescript on the outside but it has the grand ambiance of an old haveli (mansion) on the inside, with chandeliers and beautiful murals painted on its walls. The kitchen has large glass windows, providing an interesting view of the tandoor and chefs at work. Opening Hours: Noon to 3:30 p.m. for lunch. 7-11:30 p.m. for dinner daily. Cost: 2,100 rupees for two people. What's Good: The tandoori platter, with an assortment kebabs and classic tandoori chicken. Traditionally dressed waiters at this unique restaurant serve sumptuous cuisine from the Afghani frontier. Diners make their selection from menu cards in the form of a local newspaper, and can watch the food being cooked in the open kitchen. Reservations are a must, especially on weekends! Opening Hours: Noon to 3:30 p.m. for lunch. 7 p.m. to 11 p.m. for dinner daily. Cost: About 1,600 rupees for two people. What's Good: The restaurant is renowned for its dum style biryani, particularly the Gosht Ki Dum Biryani. If you like spicy food, you'll love Nagarjuna. This restaurant was started in 1984 by a humble man, from the "rice bowl" of Andhra Pradesh, with a passion for food. The menu is basic yet delectable. Opening Hours: Noon to 3:45 p.m. for lunch. 7 p.m. to 10:45 p.m. for dinner daily. Cost: 800 rupees for two people. What's Good: The unlimited veg meal. The fiery chicken sholay kebab and mutton biryani also receive plenty of positive feedback. Koshy's is another much-loved Bangalore dining institution that's withstood the test of time. It's a simple place with consistently good food, and has been open since before the British left. Head for the newer, air conditioned "Jewel Box" if you're after a fancier menu with a few exclusive options. However, the more laidback, non air-conditioned section is what attracts the diverse crowd for breakfast, a leisurely Sunday brunch, high tea, or to linger over a beer or vodka. Opening Hours: 9 a.m. to 11 p.m. Cost: 700 rupees for two people. What's Good: The breakfasts are very popular. Otherwise, try the Fish Pakauda Curry or Koshy's Special Chicken Curry. The opulent Jamavar opened in 2001 and has been voted by Forbes as one of the top 10 power dining restaurants in the world. Step in to a lavish interior of chandeliers, silk, silver cutlery, and elegant handcrafted wooden furniture. The restaurant offers a culinary voyage spanning the length of India, accompanied by the finest choice in single malts, liqueurs and Cognac. Outdoor seating is also available, along with romantic candlelit dinners. Opening Hours: 7 p.m. to 11:45 p.m. for dinner daily. Cost: About 4,000 rupees for two people. What's Good: The signature Spiced Lobster Neeruli.